"Jack and the Beanstalk," "David and Goliath," "Gulliver's Travels," "Paul Bunyan" -- giants have played big roles in many beloved tales. So it is with Sleeping Giant. Pick up: At Poipu Beach Park or to be determined when you make your reservation. Cost: $105 for adults, $70 for ages 7 through 12. Includes transportation, use of backpacks and lunch (deli sandwich, fruit, cookies and beverages). Kamaaina rates are $85 for adults and $55 for children. Notes: Wear comfortable shoes. Running shoes and sports sandals are acceptable, but hiking boots, which provide more ankle support, are the best choice. Bring sunscreen, insect repellent, sunglasses, a hat and a camera. Maximum of 10 people per group. As legend goes, a chief wanted a heiau (temple) built near his village on the east side of Kauai. Because his people were too busy tending their taro, bananas and other crops, a friendly giant named Puni volunteered to tackle the task by himself. When he finished the job two weeks later, the grateful villagers threw a luau to thank him. Puni wound up eating too much and decided to take a nap. He slumbers soundly to this day, clearly seen in the silhouette of the Nounou Mountain, five miles north of Lihue, Kauai's county seat. Thus comes the mountain's nickname: Sleeping Giant. That's just one of many intriguing stories you'll hear on Kauai Nature Tours' Sleeping Giant Mountain Excursion. Rated easy to moderate, the 4.5-mile hike traverses up and over the giant's reclining "body." Your guide will be a geologist, botanist, historian, author, cartographer or environmentalist who's spent years studying the Hawaiian archipelago, so this is not just a hike, it's a valuable educational experience. Chuck Blay, founder of Kauai Nature Tours, often leads the trek himself. A geoscientist with a Ph.D. in geology, he's an animated storyteller who can translate complicated scientific concepts into layman's terms. Before moving to Kauai 11 years ago, Blay spent 25 years teaching, researching and consulting as a sedimentary geologist who's worked in Alaska, the Rocky Mountains and the Gulf Coast to South America, Western Europe and Indonesia. In 1986 he took a month off to study the beaches, reefs and rock formations along Kauai's 111-mile shoreline, completing most of the expedition on foot. From a geological standpoint, he finds Kauai the most fascinating of the main Hawaiian islands. "It displays all the products of the many processes of geology," Blay says. "In addition to volcanology, these include subsidence (sinking due to its weight), faulting, erosion, transport and deposition of sediments, growth of coral-algal reefs, sea level changes and the development of a diverse system of environmental systems, ranging from rain forests to semideserts, across a relatively compact island area." Geologically, Sleeping Giant is to be a high-standing structural remnant of some of the oldest lava rocks on Kauai, which first appeared above the ocean 5 million years ago. 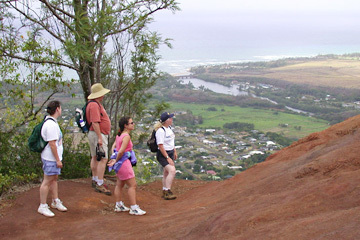 It's possible to hike up and down either its east or the west sides, but Kauai Nature Tours' excursion includes both so participants can see the differences. 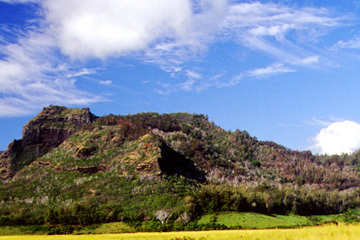 Known to kamaaina as Sleeping Giant, the geological formation on Kauai is a high-standing remnant of the island's oldest lava rocks. FROM THE WESTERN trail head, you'll cross Opaekaa Stream (which feeds Opaekaa Falls, a popular sightseeing spot) and walk for two miles along the foot of Sleeping Giant through a dense forest of strawberry guava trees. You'll also spot ti, lauae fern and hala (pandanus) and kukui (candlenut) trees. "Strawberry guava is an introduced species that most botanists would label a weed," Blay says. "It was most likely planted by foresters to help stabilize the mountainside. The early Polynesian settlers in Wailua Valley cut down the native koa and ohia trees that were originally there, for firewood and wood for their canoes and houses." Within a mile you'll get the first clear view of lush Wailua Valley, which lies between Sleeping Giant and the base of 5,148-foot Mount Waialeale. There's a good reason why this region is perpetually cloaked in green; rainfall on Waialeale averages 430 inches annually, ranking it among the wettest spots on Earth. In fact, Blay says, "The east-facing escarpment of Waialeale may be the world's best rain machine." Kauai's weather is primarily controlled by the orographic lifting of warm, moist tradewind-driven air. "Oro" is the Greek word for mountain. "Orographic" refers to the effect of mountains on the movement of air. As air is driven 3,000 feet up and against the mountains, it cools with the altitude. Because cool air can't retain the moisture as a gas, condensation takes place -- that is, water vapor converts to liquid, clouds form and rain falls. "This effect is responsible for the amazing diversity of ecosystems we find on every Hawaiian island," Blay says. "I consider it one of Hawaii's two essential features; the other being that our islands are Earth's most isolated major landmass." There are several vistas where hikers can stop to snap a photo on the Sleeping Giant Mountain Excursion. ABOUT HALFWAY into the hike, at an elevation of 600 feet, the trail turns eastward up Sleeping Giant through a row of towering Cook pines. For the next three-quarters of a mile, it ascends 500 feet. "This is the only strenuous part of the trip, but it isn't really that tough if you take your time and enjoy the amazing views," Blay says. "Near the 1,250-foot summit is a flat grassy area with a pavilion and picnic table where we usually take our lunch break." From here a magnificent East Kauai panorama stretches from Nawiliwili Harbor in Lihue north to Wailua, Kapaa and Anahola. In the early morning, on clear days, you can even see Oahu 100 miles away. While hikers munch on a hearty deli lunch, Blay discusses the Wailua River basin where Kauai's royalty lived. Remnants of heiau, birthing stones and other significant archaeological sites have been preserved throughout this sacred area. After lunch you'll head down the east side of Sleeping Giant, along a series of long switchbacks with a 1,000-foot drop in elevation. This windward side of the trail is very different from the west or leeward side due to a strange aspect of orographic lifting. As brisk tradewinds blow from the east, clouds are pushed up and over Sleeping Giant, but before they can drop any precipitation, they already have crossed the narrow ridge. Because of this, the rain falls on the west side, nourishing its lush forest. In contrast, the drier east side is mainly covered with kiawe trees, which can survive on little water. The views of eastern Kauai from this vantage are also gorgeous, and the downward trek is easy and relaxing. Kauai Nature Tours' van, full of cold drinks, waits for thirsty hikers at the end of the trail. "We hike at a leisurely pace so participants can reflect as they enter each zone," Blay says. "I ask them to think about what their senses are telling them -- not only sight, but what do they smell and hear? What kinds of textures do the leaves, bark and flowers have? How do the different varieties of guavas that we find along the way taste?" He believes that if people understand the characteristics and plant and animal life of our island ecosystems, they can better coexist with them. "In fact," he says, "with knowledge and sensitivity, they can learn to coexist effectively with the environment no matter where they are."